Hello and welcome to Day #1 Premiere of Winnie & Walter’s February new release! I am excited to share this awesome new release for many gorgeous stamp set, dies and stencil from Winnie & Walter. Today we are premiering In Bloom: Eva’s Favorite Flowers stamp set, In a Word: Kisses Cutaway and Scenery: Pattern of the Rings Creative Screenings. I LOVE In Bloom: Eva’s Favorite Flowers stamp set. There is solid and outline stamps of various flowers and leaves. These can used individually or layer them. Who does not like floral especially stylised flowers? Plus with watercolour technique being the trend at the moment, the solid floral and leaves images are perfect to stamp using distress inks and watercolour with shading. So many techniques can be used using this stamp set. So very versatile too! Here is what I did with In Bloom Eva’s favorite Flowers stamp set and In a Word: Kisses Cutaway. I went with simple layered stamping of the flowers and leaves covering the top of the card panel. Simple stamping does not have a technique involved. The trick to make simple stamping technique effective is to choose a bright and striking colour combination and get perfect coverage in stamping. I used MISTI tool to stamp so that I can get even coverage. Then I die cut the panel using the largest dotted rectangle die from Essentials: Katherine’s Cutaway. The dot around the panel adds more details. With the sentiment, I die cut In a Word: Kisses Cutaway once from black glitter cardstock and thrice from black cardstock. I stacked and glued them with black glitter die cut on the top. This gives added dimension. I adhered this sentiment on the bottom of the panel. The smaller sentiment is from another new stamp set which will released later this week. I simply stamp the smaller sentiment using black ink. I then mounted this panel on a white card base. I love the white space and the white card base. Hope you like my card using the new stamp set and cutaway. Do you like to win these new goodies? Then head over to Winnie & Walter’s Blog for more details to how enter to win these goodies. There are many gorgeous inspirations from designers at Winnie & Walter’s Blog. Make sure to stop by for Day #2 premiere tomorrow. Thanks for stopping by my blog today. That is a beautiful card. I love the bright, bold colors you used. This is beautiful! I love the colors you've used… so fresh & spring like! Beautiful card Gayatri, I just love the black glitter card stock. Really 'finished' it off with style! Gorgeous card – Love the bright colors and graphic design and oh that glitter die cut! Gorgeous card! Love the glittery sentiment and the bright, clear colors! Just lovely Gayatri!!! 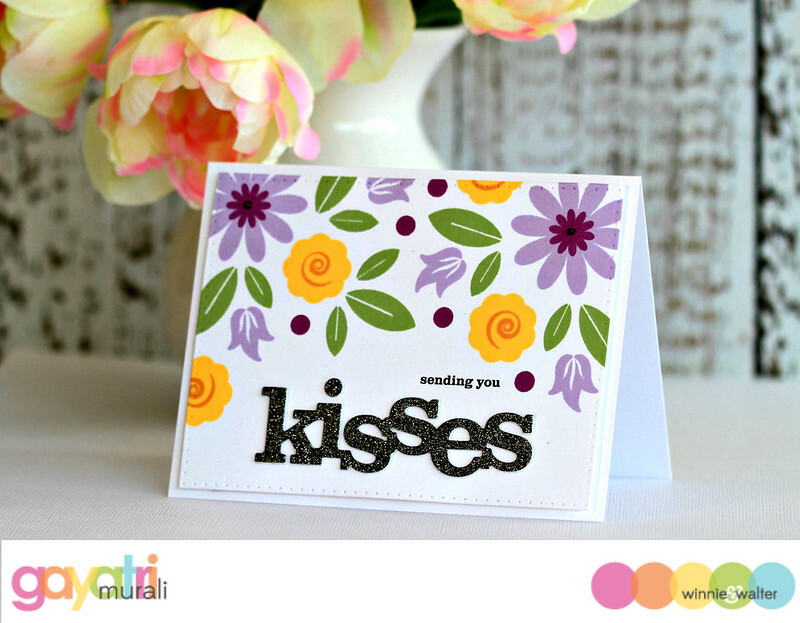 Those colors are so soft and bold at the same time – and I LOVE your glitter “kisses” word! Just perfect! Super cute, I love the sparkle and bold blooms!